The boys and I just got to read and review a new book today. I thought that it was a kids book but after trying to explain every page to G I let K have his chance to read it. 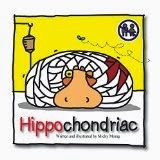 This book is called Hippochondriac by Micky Morag and it is on Amazon for $1.99 here. Basically it is a story about a baby hippo who is a hypochondriac and makes pills to prevent everything from parents to homework to showers. As a result of this he has no friends and actually gets thrown out of his hometown. We all know someone that we used to be friends with who is like this. It doesn't matter how bad of a day you are having theirs is worse. Well the little hippo and his pills eventually return home and even end up saving the day. There is a reference to a trojan horse that G didn't get and the list of things that he didn't understand goes on from there. K just wants to know where he can get the pills to prevent punishments and homework. He wants other ones too but these were top on his list. If they do exist can I get the ones that prevent bills and work? It did open up a very interesting conversation with the boys about drugs and taking pills can be helpful but they can also be harmful. So the book wasn't a total loss on G.
I give it 3 stars, K gave it 4, and G gave it 2 because he liked the colorful pictures. So our conclusion is if you are looking for a cute fun book for a teen it is great but for smaller children and adults don't waste your money. We were given this ebook for free from Tomoson in exchange for our unbiased review.